The most important parts are shown in red. Note that tickets cannot be posted to an address outside the UK. If you are not in the UK now, you may want your tickets to be sent to the address where you will be staying, or you may decide to pick up the tickets from a Fast Ticket machine (only an option at some of the larger train stations). You need a credit card or debit card to pay for the tickets. Tickets can usually be bought online up to 3 months in advance. Note that the cheapest tickets are often released about 12 weeks in advance (a bit less than 3 months) - only a limited number of these are available, so they may sell out quickly at popular times. Sometimes buying two single tickets can be cheaper than buying a return ticket. Sometimes buying two single tickets (eg A to B and B to C) can be cheaper than buying a ticket for the whole journey (A to C), but note that the train must stop at the intermediate station (B). This may happen when the journey involves travel on trains from two different train companies. Cheaper tickets may only be available at certain times of the day - for example, if you start your journey after 10am on a weekday (generally you can travel at any time on Saturdays, Sundays or public holidays). Enter the name of the station where you will begin the journey. If you enter a city's name, journeys from any of the main stations in that city will be shown. To specify a certain station in a city, include the station name after the city, eg "london paddington". Enter the name of the station where you will end the journey. To specify a certain station in a city, include the station name after the city, eg "cardiff central". Enter the day and month when you will be starting the journey. There is no need to enter a year. Choose the approximate time when you will be starting the journey. Journeys starting after this time will be shown (although you will be able to look at earlier trains if necessary). Remember to use the 24-hour clock. If you want to return on a particular date, enter that date here (day then month). If you want an "open return" ticket (a return ticket which allows you to choose the return date later), leave this empty. Note that in the UK a return ticket is normally cheaper than two single tickets. If you want to return on a particular date, choose the approximate time of day when you will be starting the return journey. Note that in the UK train journeys are often cheaper if they start after the morning peak time (after 09:30 or 10:00). If you want an "open return" ticket leave this empty. You will be shown the train times for several journeys (starting after the times you used in the timetable). If you asked for a return journey, you will also be shown times for several return journeys. Click on View to see details of a particular train (the full station names and the name of the train company). Click on Find earlier trains or Find later trains if you want to see different possible train times. Choose the number of adults (aged 16 or more) and children (aged 5 to 15). Note that children under 5 who are accompanied by an adult can travel free, but if you want to reserve a seat you have to buy a child ticket (otherwise it is assumed that the child under 5 will sit on the adult's lap if no seats are available). What type of ticket and railcard? You may be able to get a cheaper ticket if you have bought a railcard. The types of railcard which are most common for students are the 16-25 Railcard and the Network Railcard. Click this box if you do not want journeys to be shown for which you need to change trains. You can specify that you want a ticket for a Single, Open Return or Return journey. The next page will show you which ticket types are available for which journey. The fares shown on the left are in pounds. Choose which type of ticket you want (circles are only shown if the ticket type is available for that train). Click on a circle to select the type of ticket and journey time. If you are buying a return ticket, you need to click on two buttons in the same row. Check the times of the journey you have chosen. If you have selected a return ticket, check the time and date of the return journey you have chosen. You can choose a seat in a smoking or non-smoking area of the train. Note that some train companies do not allow smoking on any part of the train. If you often book tickets for the same journey, you can save your preferences to make the process quicker in future. If you need to book a hotel where you are going, some options are shown and can be booked at the same time. You can insure against loss because of missed or delayed trains, lost luggage and journey cancellation. If you do not want to buy this insurance, remove the ticks from the Outward and/or Return boxes. Check the ticket type and whether it is a single, return or open return. Check if there are special restrictions about which train services you use. Check the charges in case you need to cancel or change your journey. Your travel rights and responsibilities, and the minimum level of service you are entitled to expect from the train company. Check the restrictions which apply for the ticket type which you are buying. In general the cheaper types of tickets have most restrictions. Details about the insurance policy which you may have chosen to buy in Step 3 above. Tick the box if you accept the terms and conditions and want to buy your ticket. If you want to be able to buy a ticket using TheTrainline, you must first register (or log in if you have already registered). Click the box (to remove the tick) if you do not wish to receive further marketing information from TheTrainline. Click on No thanks if you do not wish to receive marketing information from partners of TheTrainline. The tickets can be sent to you by post, but only to an address in the UK. Cheap tickets which need seat reservations will be sent when you order them. Other types of ticket will be sent to you a few days before the date of travel. 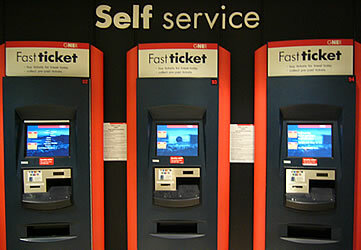 At some of the larger stations you can collect your ticket from a Fast Ticket machine. You will need a reference number, which will be sent to your e-mail address. The machines are normally located near the ticket office. To obtain your tickets, select Collect, insert the card you used for the booking, and enter your booking reference number. You will need to pay a charge if you need the tickets to be sent by post to arrive the next day. You will need to pay a larger charge if you need the tickets to be sent by post to arrive the same day (you must live in London). The billing address is the address at which the card you are using to pay for the tickets is registered. Check that the "lock" sign is shown at the bottom of your screen. This means that the details you enter should be secure.